The pros – Check it: consolidation combines all of your separate student loans into one streamlined loan, fixes the interest rate, reduces the risk of late payments, and can stretch out the repayment schedule (thereby reducing your monthly payments). The cons – By stretching out the life of your loan, you end up paying more interest than you would have on the original schedule. How much more? Sometimes up to three times as much! Holler at Uncle Sam – If you have federal loans (e.g., Stafford, PLUS), you’ll want to explore what type of consolidation plans you can find through the government. The credit crunch has tightened up the consolidation market, so this is where you’re most likely to get the best interest rates. Pick a payment plan – There are a number of options for payment schedules, so take some time to figure out how money you have and how much you plan to make in both the short term and long term. Got private loans? – Check out our article on private debt consolidation. According to MonsterTrak’s Annual Entry-Level Job Outlook, almost half of the 2007 graduating class had $25,000+ in student loans when they left school. There's no way to sugar-coat it: that's a pretty harsh "welcome into the real world" moment, and it helps explains why more and more reason grads are opting to shack up with mom and dad so they can save up money and pay off their debts. But it's not all doom and gloom, players—we're here to help you figure out if you can make the system work in your favor through student debt consolidation, one of the most popular choices for grads struggling to pay off their loans. At a very basic level, consolidation provides three major benefits: it combines all of your separate student loans into one streamlined loan, fixes the interest rate (by taking a weighted average of the current interest rate on each of your loans), and can stretch out the repayment schedule (thereby reducing your monthly payments). Needless to say, there are some storm clouds surrounding the silver lining of student debt consolidation. Once you’re comfortable with our Student Debt Overview and Understanding Loans and Debt guides, use this article to understand all the pros, cons, and intricacies of consolidation. Be sure to utilize your grace period—the six-month period when your lenders give you a reprieve from paying back any debt—to figure out your best options based on what type of debt you have. How do I prepare my debt to be consolidated? Can I use a private debt consolidator? In this article, we will focus on federal loans and consolidating through the government, but the same general guidelines for consolidation still apply to all types of loans. You'll find further information on private loans at the end and in our article on Private Debt Consolidation and Debt Forgiveness. Note: Federal loans include Stafford loans, PLUS loans, and others. But chances are you got them originally through a private company (e.g., your bank or Sallie Mae). If so, they're still federal loans and you can consolidate directly through the government. Combining all of your loans simplifies the whole process and minimizes the risk of late payments. If you took out a different loan each school year, or even a different group of loans each year, then you might be stuck with 11 different loans with 11 different monthly repayment dates and 11 different interest rates. It's easy to see how missing a payment on one of your loans isn't far-fetched. And when it comes to student loans, what's worse than missing a repayment? NOTHING. Not only does the interest rack up, but it can also demolish your credit. So by combining all of your loans into just one loan with one monthly repayment date and one interest rate, it sure will help you keep track of your debt and make sure to never miss a repayment. You can lock in your interest rates. Once you’ve locked in your rate, they will never change again over the life of your debt repayment. (If rates drop further, however, you also won’t be able to take advantage of them.) Locking in rates may seem like a slightly conservative move to the Gordon Geckos of the world, but we think it’s a safe play unless you know with some certainty that interest rates are about to drop (e.g., the government announces that they’re about to drop rates on loans). Read more about locking in variable rates in our Understanding Debt guide, and find out if rates are poised to drop by hitting up Googs and the government's loan consolidation "what's new" page. You can lower your monthly payments. This is, in our opinion, one of the best reasons to consolidate. But there’s got to be a catch, right? No doubt, son! In order to lower your monthly repayment, what a consolidator (e.g., the government) will do is extend the life of your repayment (e.g., from the original 10 years to 30 years), which will enable you to repay less each month (up to half as much!). But the additional interest that racks up over those extra years of repayment will actually result in your paying more to the consolidator overall (up to three times more!). Of course, you can still consolidate your loan utilizing your original repayment schedule (e.g., 10 years) in order to accrue the other benefits listed above. Step 1: Find out exactly how much debt you have and all the details for each loan (e.g., interest rate, repayment date, and so on). Don’t know that info off the top of your dome? Never fear—you can retrieve all of your loan information from the NSLDS. One caveat: NSLDS is very good at giving an approximate snapshot but isn't always 100% up-to-date. Thus, the NSLDS is great for finding out exactly what types of debt you have and who provided each type/amount, but then you must contact each provider directly to corroborate. Step 2: Take advantage of your grace period. How long ago did you graduate? If it was less than six months ago, hold the phone and let’s talk about your grace period. During the six month period that starts the day that you graduate from college, your lenders give you a reprieve from paying back any debt, whether it's subsidized or unsubsidized. And if it’s subsidized, the government will even pay off the interest that accrues. However, the second you consolidate (even if you only consolidate some of your debt), you forfeit the remainder of your grace period on all of your debt. Assuming you can’t pay right now and want to put off repayment as long as possible, be sure to consolidate only after your grace period is finished. (Actually, the government suggests that you consolidate one month prior to the end of the period to create some leeway for the application process; you might even want to give it one and a half months to be safe.) Also, be sure to confirm with your lender the actual start date as it may be around instead of exactly on your graduation date. Note: If any of your debt is unsubsidized, the unpaid interest during the grace period will CAPITALIZE (unless you pay it yourself). Depending upon the amount of debt you have, the capitalized interest may be negligible, but always double-check. It also may be the case that you don't have a job and suffering the interest capitalization in the short term is a risk you're willing to take (instead of spending Benjamins you don't yet have). So are you already out of your grace period, or want to consolidate prior to its conclusion? Next we'll teach you how to actually drop the c-bomb on that debt. For a quick overview of what can happen as a result of consolidation, simply plug your loan details into a loan consolidation calculator. We swear: it’'s almost fun. This will give you a good idea of what consolidation will do and if it's worth it, but it ain’t the whole story. The government’s website is comprehensive but a bit difficult to use—we suggest calling one of the helpful attendants at 1-800-557-7392 to explore your different options and get the ball rolling. But keep reading so you know what to ask about when you call. 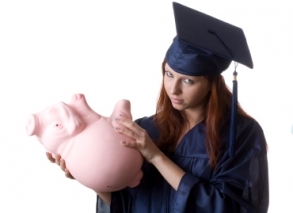 Standard Repayment loans require that you pay your debt back within 10 years. So while you are generally maintaining the original repayment schedule, you benefit from fixing the interest rate and combining all your different loans. As long as you can make the monthly payments, this type of loan is nice because you don't have to pay extra by extending the life of the loan. Income Contingent loans basically mean the repayment amount is linked to the amount of income you earn, but there are a bunch of caveats and extra paperwork to fill out. Speak to a rep at the number above before committing to this. Ultimately, we'd recommend a standard or extended loan, but this decision is of course up to you and your unique situation. While some loans need to be paid off within a certain time frame (e.g., standard loans must be paid within ten years), the maximum lifetime of the loan is determined by the total dollar amount. The government provides a chart detailing a consolidation loan amount and it's expected lifetime. Once you've decided which type of consolidation loan you plan to apply for, it's a good idea to look at the paperwork even if you plan to consolidate over the phone (again, use the number listed above). The government does a nice job of putting all of the required paperwork for student loan consolidation on one page. The only thing you'll likely need to download is the application for the promissory note, but it's advisable to, at the very least, skim through the other documents as well (e.g., Borrower's Rights and Responsibilities). At this point, it's merely a matter of filling in the forms mentioned above or calling the phone number (above) and starting the consolidation application process. We know we've mentioned this before, but don't forget that it can take up to a month for the application to be processed. So if you're taking advantage of your grace period or for any other reason you plan to consolidate at a future date, factor in this processing period. Consolidators aren't always out to get you. In fact, they'll scratch your back if you scratch theirs. For example, if you pay your consolidation loan electronically (i.e., set up your bank account to automatically wire cash to your consolidator every month), they'll shave 0.25% off your interest rate. This saves them processing fees and they're happy to pass the savings along to you. In addition, many consolidators will decrease your rates if you pay your monthly repayments on time for your first 36 months (unfortunately, the government is not one of them). To learn if your consolidator offers any additional ways not listed here, just ask. Here's a quick and easy rule: if you have private loans, you can only consolidate them through a private consolidator (the government won't touch them). If you have a federal loan, you can consolidate through the government (as described above) or a private debt consolidator. So, is it wise to side-step Uncle Sam? There was a time when there were tons of companies consolidating privately (e.g., Sallie Mae, NelNet), but due to the credit crunch most have pulled out of the market. However, it is still possible, and as we've said time and again, it's worth knowing all of your options so you can make the best choice possible given your specific situation. Check out Private Debt Consolidation and Debt Forgiveness for more. Unfortunately, you can't just run away from your debt or ignore it. Debt collectors will not only hunt you down until you cough up the loot, but they'll also count up every cent of interest and hurt your credit for every month you miss a payment. But while it's important to confront your student debt as soon after commencement day as you can, it's important to note that consolidation through the government is not your only option. In this article we've laid out the pros and cons of consolidating with Uncle Sam, but you should also check out our guide to private loans so you are aware of all your options.